And what’s an election without some signs to put your name and face in front of people. But before you do there are a few things to consider when you design that sign. Create your design at the same size as the finished size so you get the proportions of type correct. Keep visibility in mind. Too many words and small type size can’t be read at a distance – especially when someone is driving by. Choose the right colours to standout from other candidate’s signs, real estate and lawn signs. Unusual colours can be more memorable but may not be visible at a distance. Qwik Print produces direct to coroplast signs for elections. The printing is actually right on the plastic and rendering in 4-colour so it is suitable for both type and photos. 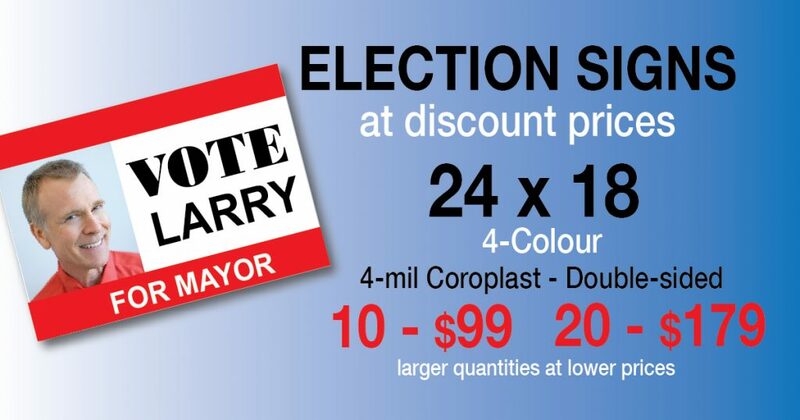 The standard sizes for election signs are 24 x 18”, 32 x 24”, 36 x 24” and 48 x 36” but can be cut produced in any size up to 48 x 48”. The thickness of the coroplast material determines the durability of the size and is available in 4-mil, 6-mil and 8-mil. For small election signs, 4-mil is the most popular. If you are planning to use H stakes, the lightweight wire stands, be sure to specify vertical flutes when you order.